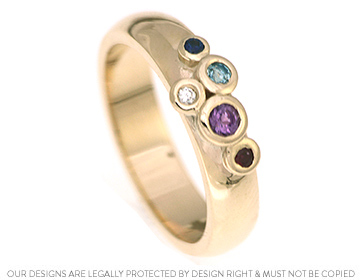 Rachel's eye-catching handmade 9ct yellow gold birthstone ring. Rachel wanted to create a 9ct yellow gold ring to symbolise the members of her family using their birthstones set into overlaid all around rub-over settings we used a brilliant cut 1.5mm mid-blue sapphire, one brilliant cut 1.5mm HSI diamond, one brilliant cut 1.75mm ruby, one brilliant cut 2mm sky blue topaz and one brilliant cut 2.5mm amethyst. 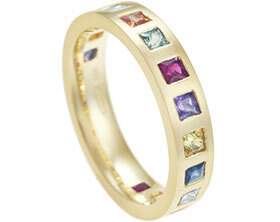 The combination of varying sizes and stones creates a beautiful ring with a 4mm wide softly d-shaped band. 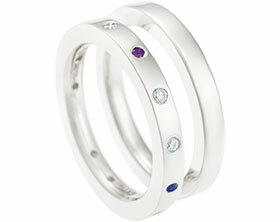 Bespoke ring with scatter set sapphires and diamonds. Bespoke pair of platinum and 18ct yellow gold rings.